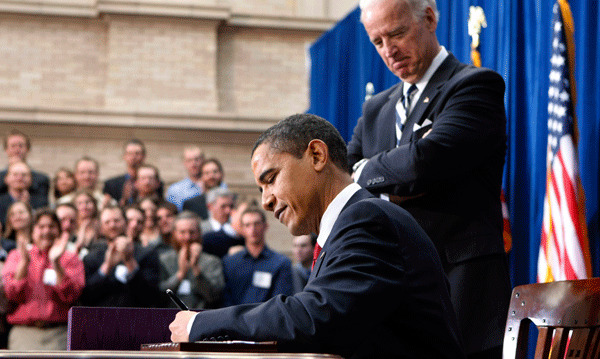 The American Recovery and Reinvestment Act of 2009, signed into law on February 17 just a month after President Barack Obama took office, celebrates its second anniversary tomorrow. This seems like a good time to take a look at all the legislation accomplished—at a time of deep economic trouble and amid serious worries that the Great Recession could well become the second Great Depression. While Congress debated the legislation in the winter of 2008-2009, the private sector was shedding a record number of 700,000 to 800,000 jobs per month. The bursting of the housing bubble and the ensuing financial crisis—after nearly a decade of hapless supervision of the housing and finance sectors by the Bush administration—had thrown the U.S. economy into a tailspin. In the last months of the Bush administration, the federal government, the Federal Reserve, and Congress had taken extraordinary measures to stop the credit markets from freezing. Yet the crisis in the real economy—the one where American workers find their jobs—was only just beginning. By February 2009, it was clear that the economy needed a swift boost in demand. Traditional policy levers to fight the deepening recession had already been put into action, but the gap between what our economy was producing and what it would be producing if workers and the economy’s productive assets were to used at full employment rose to a whopping 7.5 percent of gross domestic product, or GDP, the sum total of all goods and services produced in our economy. This so-called “output gap” had to be filled or many more workers would lose their jobs. The economy may be a complex math problem, but it is a math problem just the same. If you want the economy to create jobs, it needs to grow. There are four mechanisms by which an economy can grow: Consumers can buy more, capitalists can invest more, our businesses can export more, or the government can spend more. Typically, the government responds to recessions by boosting consumption and investment through making it cheaper for households and firms to borrow and spend. By late 2008, however, the Federal Reserve had already lowered the federal funds rate—the rate at which banks borrow from each other overnight through the Federal Reserve, which in turn affects other lending rates in the economy—down to effectively zero. And given the collapse of the housing market and the overleveraging of households, the likelihood was slim that policymakers could induce consumers to buy more even if that was a good idea. Even at rock-bottom interest rates, firms will not invest if they do not see potential customers—and in late 2008, with financial markets still in crisis and the consumers strapped, investment plummeted. Policymakers were left with boosting net exports or government spending. While addressing the fact that the United States imports far more than it exports is a priority of the Obama administration, this is a longer-term issue that policymakers could not effectively address quickly enough to stem the tide of rising joblessness. 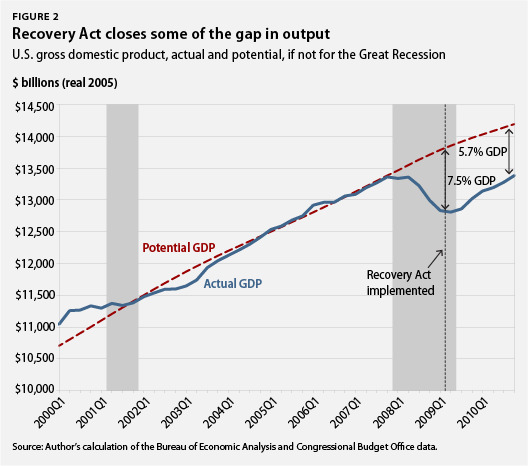 Therefore, policymakers were left with fiscal policy and it was the Recovery Act that provided the much-needed immediate boost to aggregate demand and filled in the output gap by pumping $787 billion into the U.S. economy. The Recovery Act included tax cuts equal to about $282 billion, alongside increased funding for infrastructure and energy independence, help for states struggling with falling revenues, and aid to those hardest hit by unemployment. Together, as the new law was implemented, it saved and created millions of private-sector jobs, averted an even worse economic crisis for working families, and helped avert an even bigger federal budget deficit by growing the economy. Still, the new law did not do everything it could have to drive a sustained economic recovery. So let’s look in a bit more detail at what the Recovery Act accomplished. 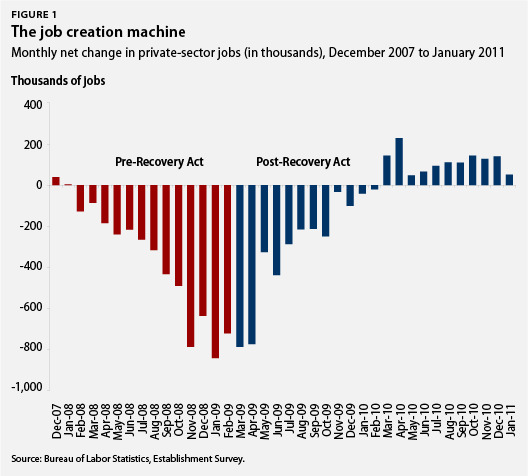 The nonpartisan Congressional Budget Office credits the American Recovery and Reinvestment Act with increasing employment in the last quarter of 2010 by 1.3 million to 3.5 million jobs. The Recovery Act kept teachers in schools and police officers on their beats, even as tax revenues fell. It kept money flowing into the pockets of the long-term unemployed, which in turn not only helped those individual families hardest hit by the Great Recession but also helped keep dollars flowing into their local communities. It helped unemployed workers access health care, undoubtedly mitigating the well-documented negative health effects of unemployment. One of the most effective uses of Recovery Act dollars went to benefits for the long-term unemployed. In a report for the Department of Labor, Wayne Vroman, economist at the Urban Institute, estimated that the unemployment insurance system closed about one-fifth (18.3 percent) of the shortfall in the nation’s gross domestic product during the Great Recession. To put some back of the envelope numbers on this, think of it this way: The typical worker brings home about $40,000 annually and today, nearly 14 million are out of work, so without unemployment benefits, our economy would shrink by about $600 billion. The steps taken to shore up our economy were a better investment for jobs and for the deficit than doing nothing at all. This may seem counterintuitive, but think of it this way: As millions lost their jobs, they paid much less in taxes than they had when they were employed, reducing federal revenue and driving up the deficit. Further, the unemployed stopped spending as much as they had before they lost their job, and firms invested less in fear of a lack of customers, both of which also reduced tax revenues, driving up the deficit. We can see this in the data. The most important reason for the rise in the deficit was rising unemployment and falling incomes. In 2009, federal receipts were $419 billion below 2008 levels, a 17 percent drop, which was the largest decline from one year to the next in more than 70 years. Individual income tax receipts decreased by 20 percent, and corporate income tax revenues plummeted by more than 54 percent, which means corporations paid less than half in taxes than they paid the year before. Economists Alan Blinder and Mark Zandi estimated that had Congress done nothing, the deficit would have ballooned to more than 2.5 times as large as it did by 2012, hitting more than $2 trillion by the close of fiscal year 2010, which ended in September 2010, $2.6 trillion in fiscal year 2011, and $2.25 trillion in fiscal year 2012. Further, they estimated that without the American Recovery and Reinvestment Act and other fiscal policies, unemployment would have reached over 11 percent, rather than the 10.1 percent it reached in October 2009, and job losses would have totaled 12.4 million, rather than 8.8 million. Our nation’s fiscal position has deteriorated appreciably since the onset of the financial crisis and the recession. To a significant extent, this deterioration is the result of the effects of the weak economy on revenues and outlays, along with the actions that were taken to ease the recession and steady financial markets. In their planning for the near term, fiscal policymakers will need to continue to take into account the low level of economic activity and the still-fragile nature of the economic recovery. In short, sustained government spending is necessary until the economic recovery hits its full stride. That is the best option—alongside maintaining a competitively priced dollar—to push the unemployment rate down. In prior recessions, lowering interest rates was sufficient to push the economy toward sustainable growth, but this time it’s not possible. The last recession that brought us double-digit unemployment, in the 1980s, was caused by tightening of monetary policy by the Federal Reserve under Chairman Paul Volcker as he and his central bank colleagues were trying to address rampant inflation. The federal funds rate hit nearly 20 percent in 1981, which stopped inflation but then also gave the Federal Reserve a great deal of room to lower rates to encourage economic activity. This was not the case in the Great Recession. The Federal Funds Rate has hovered around zero since December 2008. To boost growth, the Federal Reserve has pursued quantitative easing, using the proceeds from the central bank’s mortgage bond portfolio to buy long-term government debt. That is, they are using unorthodox methods of pumping money into an economy and working to lower interest rates that central bankers do not usually control. The effect is the same as printing money in vast quantities, but without ever turning on the printing presses. The Federal Reserve’s response to the Great Recession has been effective in lowering interest rates and addressing the crisis in the banking system. But it has not yet successfully increased investment or led to sufficient job creation. Sometimes, fiscal policy is the only option left. Even with the success of the Recovery Act since its enactment two years ago today, there remain clear indications that in order to fill in the output gap and lower unemployment, Congress will need to continue to focus on policies that raise, not lower, aggregate demand. Yet, the House is seeking to make deep cuts to the budget that include reductions in education, innovation for energy efficiency and independence, health and life sciences technologies, infrastructure modernization, and export development, even as unemployment hovers at 9 percent and job gains while positive, have been fairly tepid. The president’s budget would also not address the aggregate demand problem, but it would focus spending on investments that will have a positive impact on growth in the medium to long-term. Further, it is important to note that while nearly $800 billion may sound like a great deal, in reality, the stimulative impact was smaller. First, $70 billion of those dollars went to spending that the government would have likely done anyway for the annual patch of the Alternative Minimum Tax, a tax designed to make sure higher-income households pay a minimum amount of taxes, yet since it is not indexed to inflation, it hits families at lower income levels each year unless Congress acts to fix it. Second, too much of the Recovery Act funds were spent on programs with small multipliers, economist-speak for how much economic growth we see for every dollar of spending. In particular, the Recovery Act tax cuts constituted a third of the whole package even though they have the smallest multiplier among the kinds of spending done in the Recovery Act. The upshot: More of the package should have focused on spending in areas with the highest multipliers, such as more aid to the states. Indeed, even as the federal government increased spending through the Recovery Act, the states were cutting back, so in the end the bump-up was less than advertised. State governments have cut back spending sharply and continue to do so even as tax revenues begin to rise amid the nascent recovery, which means going forward the federal government needs to maintain its focus on stimulative economic investments to ensure we leave the Great Recession well behind us in the coming years. Heather Boushey is an Economist at the Center for American Progress.